When you can’t create value anymore or when you are not enjoying what you are doing anymore, simply walk away! 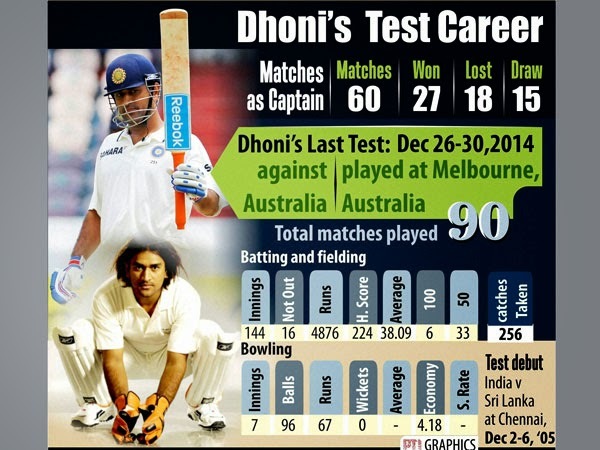 M.S.Dhoni surprised the cricketing world yesterday by retiring from Test Cricket. As India’s most successful Test Captain ever, everyone believes Dhoni has a lot of cricket still left in him. But the man himself thinks that he’s played enough of that format, having won 27 Tests for India and having led his team to be the # 1 Test side in the world, a slot the team retained for 21 months. Dhoni has always been remarkable – for being able to deal with victory and defeat with equanimity. His ability to stay unmoved in the middle, amidst all the action and chaos, has earned him the title of “Captain Cool”. But with his decision to retire from the oldest form of the game, Dhoni teaches us something far more valuable – he’s telling us that we must learn to let go and simply walk away when we must. If you examine your Life closely, you will discover that much of your grief comes from clinging on to stuff – people, opinions, positions, things, money and such. The more you hold on to something, the more you will suffer. Such is the nature of Life. Life is in a perpetual, never-ending flow. To imagine that your Life should or will remain unchanged is downright foolishness. Trying to control Life is like holding on to water in your palm – it will simply flow away! Each of us has a season in the sun just as we have our dark spells in Life. In our chosen vocation or in a field of interest, or in Life in general, we will have our own triumphs and travails. Yet we must never see any of this as permanent. We must learn to move on with time. We must also be willing to accept and appreciate that the generations that follow us will be smarter at doing whatever we believe we are currently best at. So, the intelligent way to live is to make way for others and for Life itself. Coming in the way of Life, by holding on to anything that you imagine is your own, is sure to cause inner strife and suffering. A simple rule of thumb can help here. In any situation, in any context, ask yourself if you are able to make a difference and create value? If the answer is no, walk away. Ask yourself if you are enjoying what you are doing or saying or whether you are enjoying being with someone? If the answer is no, walk away. It is that simple. Really! Life often opens newer avenues when you let go of something or someone or some situation. Even if it immediately doesn’t, the very act of letting go is liberating. Clinging on is always about being under pressure, about wanting to prove a point – sometimes even to yourself. But when you let go, there is no proving anything to anyone. When you let go, when you walk away, you are actually telling Life that you are open for new possibilities and opportunities. You are setting yourself free. And only when you are totally free can you be in bliss!